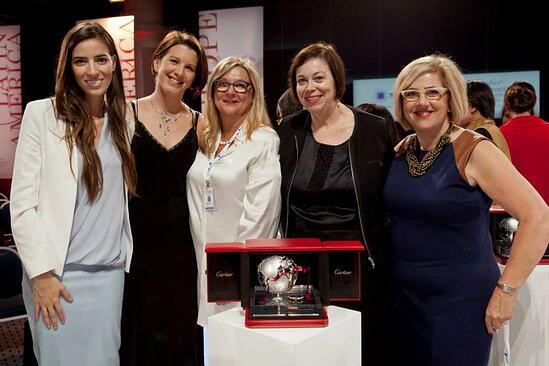 North American Jury members, including TPD CEO Leslie Meingast, with the 2014 finalist and laureate, Eleni Antoniadou. Eleni Antoniadou, nominated Laureate for North America, was the first to receive her trophy for her stem cell company Transplants Without Donors, followed by Bel Pesce from Latin America for her professional and personal development company called FazInova, and Europe's Carla Delfino, whose company Imperial Europe produces organic non-toxic repellents to control, not kill, pests. Achenyo Idachaba was named the Laureate from Sub-Saharan Africa for her company MitiMeth which weaves useful products from invasive aquatic weeds. Mariam Hazem won the award for the Middle East and North Africa for her venture Reform Studio that weaves plastic bags into contemporary design objects. And finally, Diana Jue & Jackie Stenson from Asia-Pacific were named Laureates for their company Essmart Global, bringing life-improving technologies to low-income rural populations. Each of these impressive entrepreneurs received funding of $20,000 USD, networking and visibility opportunities and, most importantly, personalized business coaching for one year. TPD’s own Founder and CEO, Leslie Meingast sits on the International Jury Panel for the Cartier Women’s Initiative Awards alongside many other talented and esteemed jurors from around the world. The Cartier Women’s Initiative Awards offers one-to-one personalized business coaching for the eighteen finalists representing the top three projects of each continent. The Cartier Women’s Initiative Awards aim to encourage the most vulnerable category of entrepreneurs in their most vulnerable phase: women entrepreneurs starting up. Since their inception in 2006, they have accompanied over 100 promising female business-owners and recognized 40 Laureates.